Different authors appeal to me for different reasons. Some writers consistently wipe away my cares by yanking me into a heart-pounding world of action and suspense; others create characters so real that I miss them when they're gone; still others make me swoon with the sheer beauty of their wordcraft. An author who can successfully combine all three is a treasure indeed. Since I've only read one book by Beth Kephart, I can't speak to her consistency; however, judging by The Heart Is Not A Size, I'd say she falls solidly into the last category. Why? Because although I thought the novel's plot dragged, sometimes awkwardly, sometimes disjointedly, I hardly noticed because I was too busy savoring Kephart's every word. She sculpts each sentence until it's pure poetry - lovely, lyrical and full of subtle meaning. "In Juarez all my little self-imposed rules would be tested, the things I tried to control, my minuscule attempts at doing most things right ... I needed a release from the narrow outlines of my life" (17). "... there were fuzzy collisions of optimism and despair, opportunity and danger, welcome and barbed fences. The ghosts of murdered women. The faces of children left behind. The chance to help. The possibility of being helpless" (87). These contradictions only intrigue Georgia, convincing her that Mexico is exactly the cure for the neuroses that ail her. She can't wait to shed her outer skin and discover precisely what lies beneath. The ever-responsible Georgia can't quite escape all of her duties, however - she has to look after Riley, after all. Although she feigns ignorance, Georgia knows what her friend is doing too herself, how desperate she is to earn not only her mother's attention but also her approval. Georgia can't wait to whisk her out from under Mrs. Marksmen's manicured thumb, to give her the chance to see herself in a truer light. So, packing different agendas, the girls head to Anapra, a squatter's village south of the border. Along with 9 other teens and several chaperones, the group sets about building a community bathroom for the village's poverty-stricken residents. It's back-breaking work, performed under the blazing Mexican sun. Georgia's exhausted, but thrilled by the landscape, by the smiling children, by the photographs she takes to capture the experience. Then, things take a turn for the worse. Georgia knows she has to help Riley, but the tension between them is palpable. Is she finding herself in Mexico only to lose her best friend? Will the secrets they keep, the truths they dare not broach, keep them apart forever? How can Georgia stop Riley from self-destructing? Can she help her friend find herself when Georgia's not even sure who she, herself, is? Will Juarez be the glue that holds Georgia and Riley together or the one thing that will rip them apart? 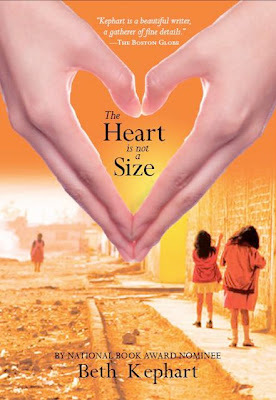 It's difficult to describe the plot of The Heart Is Not A Size, because not a lot really happens. The novel is based on Kephart's own transforming experience in Mexico, and at times, it reads more like a memoir than a novel. Her description makes the tiny village of Anapra come alive, makes her characters live and breathe, but also weighs down the story a tad. It's apparent from the first chapter that the novel's not going to be plot-driven, but I still wish it had moved a little faster. At its heart, of course, the book is about a friendship. It's also about things we see and things we don't see, secrets needing to be kept and truths begging to be revealed, people making themselves invisible when what they really want is to be seen. (If I was reading this for an English class, I'd go through and mark all the references to looking, seeing, losing, finding, remembering and forgetting and turn it into a brilliant essay.) This is not the kind of book you are going to fly through, flipping pages as fast as you can to get to the cliffhanger at the end. The Heart Is Not A Size is the kind of book that will have you combing back through the pages, re-reading passages for the deeper meaning you know is there. It's a multi-layered, ponderous type of tale that will have have you digging into your own heart, wondering what, exactly, it's made of. In short, this is not the dizzying thrill ride so common in teen novels - it's more like a railroad journey, slow and contemplative. Not what you're used to, but worth it. So worth it. What a lovely post! Based on your review, I am looking forward to reading this book. I love the trailer too. Thank you for these comments about Beth Kephart, one of my favorite writers for the very reasons you described. Ever since I read the mesmerizing A Slant of Sun, I've been hooked. Her writing is absolutely gorgeous. And yes, I do go back through her work, simply to be able to re-read those gloriously-crafted phrases. I something in me reveres her ability to create such beauty, even though any "skills" I may have that are exhibited in my own book are in no way in a similar vein. It did my heart good to read your glowing review, and to know that someone else loves her writing for the same reasons I do. Oh, and although I loved the video, even then, I wanted to cry, "No!! This needs to be read more slowly so that the words have time to melt down into souls of the people hearing this!" and I wanted to stop it half a dozen times to savor each lovely phrase. Okay, enough KepHEARTing! But yeah, she's wonderful.